I downloaded this novel last summer because the main character is a product of the foster care system in the US and I thought it would have some interesting things to say about that system and the difficulties it presents to children in it. In some ways the novel does do that, but mainly it is a reflection on parenthood and flawed parenting. How do you become a good adult/parent if you haven’t had one? The story is told from the point of view of Victoria Jones, an 18-year-old who has just aged out of the foster system and is on her own with almost nothing to her name. Victoria has been a troubled, problem child whose behaviors isolated her from peers and adults. What the reader learns is that much of her behavior has been a response to the abuse and neglect she endured from foster families. By the age of 11, after one final placement with a woman named Elizabeth, Victoria is sent to a group home where she will stay until she is 18, by court order. The reader meets Victoria on her final morning at the group home and we quickly learn that among her few possessions is a dictionary of flowers which had been Elizabeth’s. We also learn that something tragic happened while Victoria lived with Elizabeth and that Victoria’s talent with and understanding of flowers and their meanings is both extraordinary and linked to her time with Elizabeth. As Victoria enters the world as an adult, she also flashes back to her childhood, particularly the events that brought her to Elizabeth’s home. Elizabeth was a foster parent who also owned a vineyard (all of the action takes place in the San Francisco area) and taught her about both grapes and flowers, including their language. The “language of flowers” is a Victorian Era concept. Each flower had some particular meaning and lovers might communicate with each other through the bouquets they sent. Victoria and Elizabeth have a rocky relationships at first, but as Elizabeth reveals more of her own past to Victoria and her reasons for taking her in, Victoria learns to open up and trust an adult. Yet, Elizabeth’s past and her own unresolved issues from her childhood, and Victoria’s fears and desires regarding her relationship with Elizabeth, are going to lead eventually to Victoria going to a group home. While this backstory is slowly unraveled, the reader is also following Victoria in her present-day life. After leaving the group home, she spends time homeless and living in a park, where she tends to plants she has stolen from people’s yards. She eventually finds work with a florist named Renata. Renata recognizes Victoria’s skill with flowers and respects her boundaries. She brings in Victoria to help with the buying of flowers and working with brides and other customers who come to the shop. While working for Renata, two important developments occur that will have significant impact on Victoria’s future. First, Victoria uses her knowledge of the language of flowers to help customers find bouquets that seem to have an almost magical impact on their lives. Victoria’s talents put her in demand with brides-to-be in particular. The other development occurs on Victoria’s first visit to the flower market with Renata. A young man who runs a stall seems to recognize Victoria and shows an interest in her that Victoria finds unsettling. This man, Grant, and Victoria will embark on a relationship complicated by their shared history and by Victoria’s feelings of guilt and her conviction that she is doomed to fail, disappoint and hurt those who enter her life. The two story lines of Victoria’s past and present come together in dramatic fashion. One of the strengths of the novel is in author Diffenbaugh’s depiction of Victoria’s mental and emotional states as a child and young adult. This is a traumatized young woman and I think many readers will commiserate with her feelings of fear and worthlessness as she struggles with the things that happen to her as an adult. 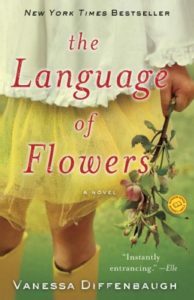 The information about the meaning of flowers is also fascinating, and Diffenbaugh includes a brief dictionary at the the of the novel. I must add, however, that as much as I liked this novel, there are some aspects of it that seemed a little forced. Renata is an almost unbelievably sympathetic and helpful character. She overpays Victoria (how much do florists in San Francisco make? ), gets her a place to live, and puts up with other shenanigans despite only knowing her for a short while. I also felt that the resolution of Victoria’s past and present story lines was a little too easy, given what really happened between her and Elizabeth. Still, this is a page turner, and if you find yourself stuck inside on a weekend or in an airport, this novel will keep you engaged.